WHY DOG SHOW ENTRIES DECLINE - "POLITICS"
AKC dog clubs are losing a lot of exhibitors. The super rich can only enter (or win) with so many dogs so perhaps there should be changes to make it more equitable for other dog show exhibitors with equally as nice dogs to also win. Big campaigners or long time exhibitors are at every show, no matter how small. They share the top placements, leaving the others to make or “fill” points and ratings for thier dogs. 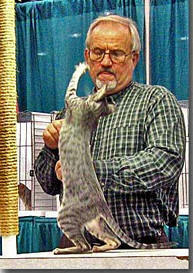 The same thing is happening at most cat shows. With AKC, when the breeds go into the group, there they are, the same dogs week after week, show after show. Those who advertise and have the big time handlers get the top three slots with some judges being kind to a “new” dog. No surprise there, the judges know who the big dogs are, and if not, they know which handler is on top because of the heavy advertising. And then the magazines proudly tout the top dogs in each breed. Here is a reality check folks, those dogs in the top 20 are not necessarily a great dog or even a good one. In today’s show ring, it is mostly a matter of big money, big handler, big advertising that gets a dog into the top rankings. I hear the complaints time and time again at the shows, with many saying something like "I really prefer showing at UKC shows, it seems to be fairer". That may be true, I don’t know but I do know that the small local AKC shows used to be a good place to start a dog and now, it seems like the big dogs are there too. Well, for those looking for small shows, you got your wish. I was at a cat show recently and the club had 103 entries. Dog shows that normally drew way over a thousand are down to a few hundred. Not a good thing when you consider that the clubs already had a major outlay of funds to put on the show. Worse yet, the good dogs with good pedigrees that can contribute to the whelping box are lost to the breed because the dog owner says 'the hell with it, I don't need this' and they quit showing altogether. That's a problem for the breed and the sport because as I’ve said before ' you can't buy what you can't see'. In this case, most people won't breed to a dog unless it has at least a CH title and to sell to good show homes, it just about has to be a “ranked” dog to sell the puppies. So the spiral downward continues, and it appears that it hasn't even hit bottom yet. Maybe it is time for AKC to re-evaluate how they do shows, change the Rules and make it fair for all exhibitors. It is too expensive to get lucky and still only come home with a point or two. First, the points system needs to be adjusted, and quickly! Majors are hard to come by gone are the days when you could drive to a little show and think you could get some Group points for that new special. All the big guys are doing the same thing! And they get paid to travel. “Hurricane Ike” caused a lot of damage to the Texas/Louisiana area, but even though a lot of show vendors sustained tremendous damage to their homes, most made it to support the shows and provide service to the show exhibitors. Sure it was an added hardship but we here in the Houston/Galveston area are pretty tough cookies. The hurricane is not the reason shows are losing entries. The bottom line is, declining entries can be remedied but there must be changes. This goes for AKC, CFA, and probably other dog and cat clubs too. This is the 21st Century, things have changed dramatically over the past few years but it appears that both dog and cat shows are stuck in a 'time warp'. Instead of meeting the current economic climate, they think they can continue to 'do business as usual'. Entries are down, families and hobby breeders are giving it up and PETA and HSUS are turning the pressure on. 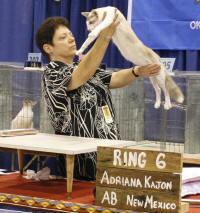 All of which is affecting the sport of showing and breeding, whether it be dogs or cats. Things are just not like what they used to be and never will be again. The future of the dog and cat shows comes down to having new people come to shows believing they can win because they will get a fair shake. We need them to get involved in the sport and they cannot do that if they do not first, come to the shows. And second, talk to average exhibitors who are not discouraged, who still love the shows and the social opportunities and win often enough to make it worth while. Then new people can fairly decide whether it is for them or not. But if they come to a local show and there are no vendors to show them new products, and even worse, no one has time to talk to them, or those who do project an increasingly negative picture, well, they won’t come back. So it is back to no gate, no vendors, no entries, no shows.